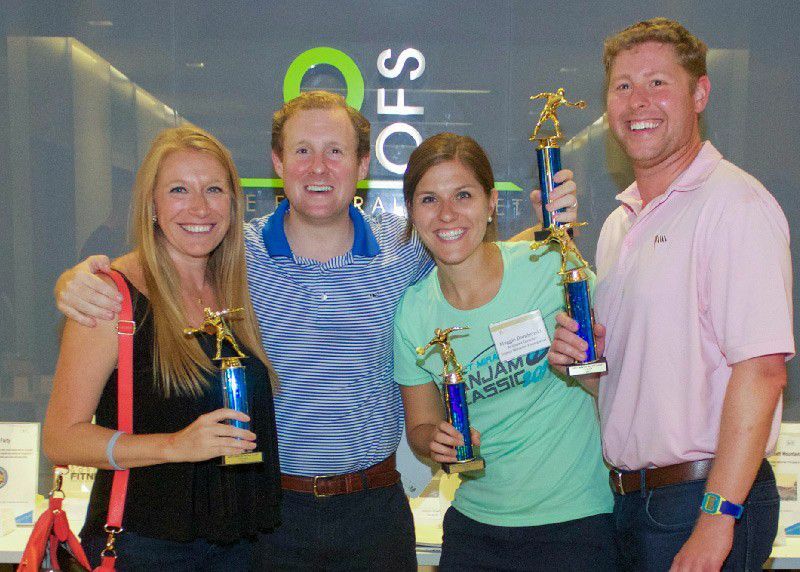 On Tuesday, August 22, 200 young professionals came together for a night on the rooftop garden at 9OFS for the 3rd Annual Expect Miracles Foundation Kan Jam Classic. A record thirty-two teams committed to this year's fundraising goal for cancer research and the Expect Miracles Foundation college scholarship, awarded annually to a student who has been affected by cancer. Thanks to the efforts of all our teams, sponsors, volunteers, and spectators, this year’s Kan Jam tournament raised over $23,000 and set a new fundraising record! Special thank you to our Competition Sponsor: Financial Recovery Technologies, our Tournament Sponsor: Eastern Bank and our T-shirt Sponsor: Income Research + Management. Teams of 2-4 battled for the trophies in the Kan Jam competition while spectators relaxed outside on the grass and enjoyed additional activities provided by our sponsors. Guests could kick back in the Tommy Bahama spectator lounge and enjoy live music from the band Frankalanka and the Funks. In between cheering on their teams, guests could mingle and play lawn games such as giant checkers and Connect Four, generously donated by Friends of Post Office Square. Throughout the night players and spectators had a variety of drink choices to cool down with on the beautiful day, such as Essentia water, Honest Tea, and a selection of alcoholic options provided by Burke Distributing. No one went hungry thanks to 5 Napkin Burger, Al Capone’s, Anna’s Taqueria, Barlow’s Restaurant, Bon Me, and Hippeas. Guests tried their luck in the chance table to win some great prizes such as a paint night and dinner, a year of free Panera bread, an Adventure Package in Boston, and the grand prize for the night – an amazing trip to Las Vegas thanks to Caesar’s Entertainment. Congratulations to all the winners! Congratulations to the top Kan Jam teams who walked away from the night with something better than food and free swag – bragging rights and trophies! This year the honor of Kan Jam Classic Champion went to team U Kan’t Jam This after a close match with Phi Slamma Kan Cancer Jamma, who came in second. In third place was team Pup N Suds. Congratulations are also in order for the event’s top individual fundraiser, Chelsea G. from Income Research + Management, who took home a gift card to Reelhouse and a custom Boston Red Sox Kan Jam set as a prize for her marvelous efforts. As always, special thank you to our amazing volunteers who donated their night to help support Expect Miracles Foundation and the fight against cancer. We couldn’t do it without you! This year has been full of some amazing events and fundraising efforts hosted by YPEM, and Expect Miracles Foundation is so grateful to all of the generous companies and individuals who support us throughout the year. If you did not get a chance to donate, but still wish to do so, you can donate here.